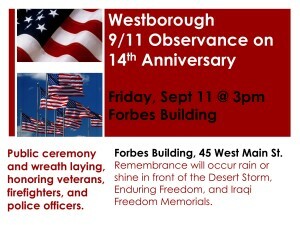 Led by event organizer Abby McLucas, a Westborough High School freshman, there will be a small ceremony in town on Friday to commemorate the 14th anniversary of the 9/11 attacks. The short ceremony will include a wreath laying honoring veterans, firefighters, and police officers (all three groups will be present) plus comments and reflections offered by several community leaders. Abby has planned this event as part of her involvement with Project351 (www.project351.com), a state-wide service program which includes having each of the Commonwealth’s 351 towns designate an 8th grade student to serve as an ambassador for positive change. Abby was selected last year as Gibbons’ student ambassador in recognition for her exemplary ethic of service and demonstration of Project 351 values of humility, compassion, kindness, and generosity of spirit.